I, for years have been devoted to oils. Every year there's a new miracle oil & superfood but to be honest, oils have always been amazing, it's what you're looking for in an oil & how to get the best out of it for you. Throw out the myth or any thoughts if you have oily skin & think it's going to be the worst choice of your life because it's not. Oil loves Oil. I have combination skin, oily & normal, sometimes dry (definitely not dehydrated, I'm a Camel). I've been lucky to have the chance to be sent a few oils this year all of them I've never used before. You see during my oil venture I've used Jojoba, Almond, Papaya, Coconut, Carrot, Apricot, Black Cumin (hair), Castor - for the hair too, Argan, Grapefruit, Grapeseed, Hemp, Olive Oil, Peach Kernel, Vitamin E...& I'm probably missing a lot more off that list, I love to experiment with oils for my skin & hair but an oil that has escaped me was Rosehip Oil. Rosehip oil is good for all skin types and as mentioned before even oily, it helps regulate natural sebum production. If you've got skin concerns such as wrinkles, scars, burns, stretch marks, pigmentation, dry & sensitive skin, sun damage, acne & acne scarring. This oil can be brilliant for you. - A natural source of Vitamin E, which is an anti-inflammatory, anti-oxidant. - Calms & hydrate dry and sensitive skin. - Protects skin cells from sun damage. - Essential fatty acids omega 3, 6 and 9 - helps repair and regenerate damaged skin tissues. - Natural source of Vitamin C, skin brightening, anti-ageing, anti-oxidant ; helps to improve pigmentation and restore the skin tone. Also helps protect skin from the sun. - Fights against premature anti-ageing & improve skin texture thanks to the natural source of antioxidant lycopene. Also Beta-carotene helps prevent free radical damage, responsible for skin ageing. Amelia Moss, they were so kind to send me a Rosehip oil but also Rose water, I had tried rose water before but I'm sure it was for cooking and wasn't pure. From my own experience, I was amazed at how it reminded me of more a dry oil the way it's absorbed into the skin very quickly, doesn't sit or make me look like it's a new place they can strike oil. I like to apply it after a cream moisturiser if necessary or use alone, which is mostly how I use it. Since stripping back my skin care & using purely oils my skin has been thriving, I do feel diet can come into it as well as just good skincare. Since using this in rotation with another oil previously reviewed it's helped diminish any pigmentation, I know how any pigmentation mark on my skin can become quite dark but I'm extremely surprised how light in appearance it's become even from when the spot was going down and started to scar. That started to sell me even more. 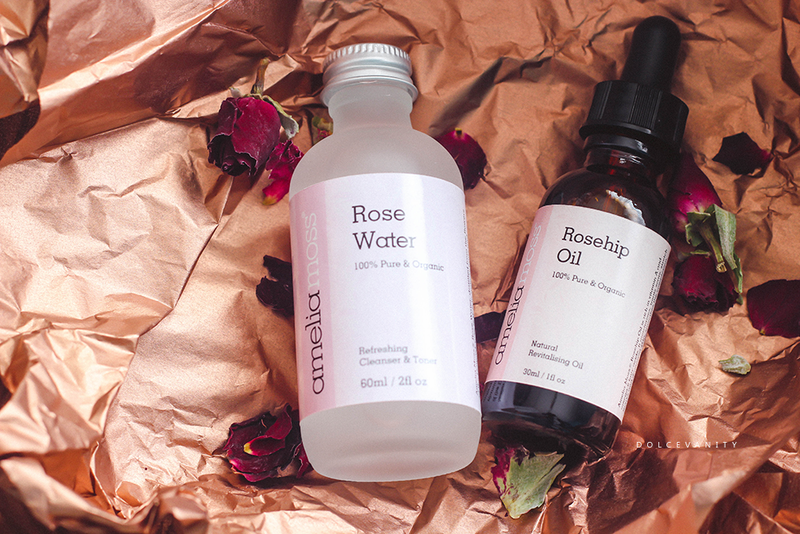 Amelia Moss Rosehip Oil comes with a dropper which makes it easier to control. I used my dermaroller for my cheek & applied Rosehip Oil afterwards and if you've ever used a dermaroller you'll know the skin is healing & repairing itself and can get a little dry - Nope, not with this! Adding the rose water as a toner has been a welcomed addition, it's a relaxing but quite enhancing smell on the senses. Doesn't dry out the skin and any irritation it calms while helping remove bacteria & decreases inflammation. With a lot of the same properties as Rosehip oil I find it more gentler but effective than other toners. Other great uses, eye brightener, makeup remover, drops in the bath, use after shaving (male or female), add rose water in a travel spray bottle and refresh your makeup or skin throughout the day. 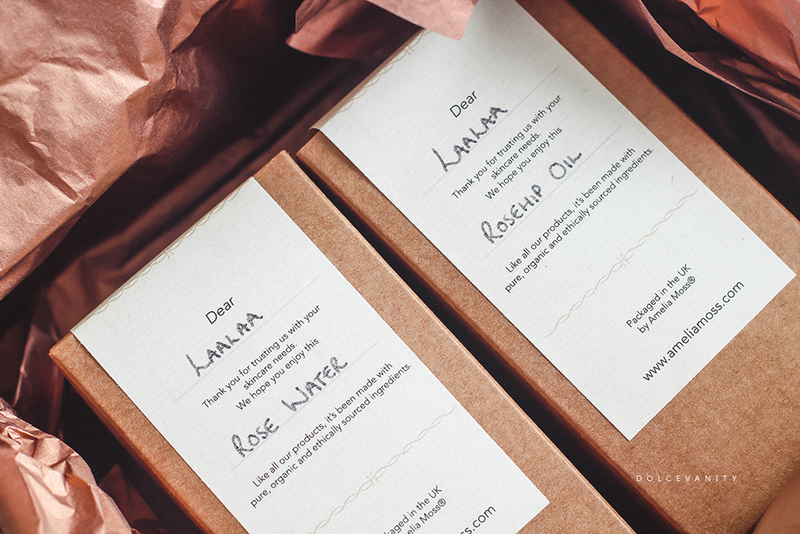 Have you tried Rosehip oil or Rose water before? I have combination skin as well its oily dry and sensitive and putting oil on your face helps counteract the oily skin. It truly does. I love that about oils. It's a huge misconception that you shouldn't use oils on oily skin I feel. Muhaha, I've made it to your page! Firstly, what on earth is a Dermaroller, and where do i get one? I've used reship oil before but I think I forgot and never saw the results, I'm really lazy with skin care because my skin is relatively good, but if this helps with pigmentation I think I might have to reinvest as I've just been using a drop of lavender oil on my skin when I moisturise ... if i do (I use tinted moisturiser for makeup normally and don't bother)! The packing though! Beautiful! I love pretty things, ha! Micro needles on a roller, punctures the skin but you can't tell and it tricks the skin into quickly repairing and healing it. Great for those with acne scarring or pigmentation. I got mine off eBay. I love Rose Water! I have made my own before, it's amazing stuff! I have also always wanted to try Rosehip Oil! Oh what a good idea! You should it's such a beautiful oil. Thanks for your comment. thats really intresting! I never tried one before so I will give a go i think! I have combination skin so it may work for me! It really should because it will balance it out, hope it does work for you too. Absolutely LURRRRRRRRRRRRRRRVE Rosehip oil! I find it to be really light on my face and it just makes it feel really smooth and soft. Doesn't it. Some dope, light oil. Absorbs amazingly well - thanks girl. I'm becoming quite addicted to oils as they seem to be making such a difference to the dryness of my skin. Love Rosehip so would probably love this too. Oh yes Rosehip would suit if you've got dry skin.